Lurch has reformed and as he was last programmed to arrest OverLord, he transforms into Frank Darling and once more takes the elevator up to his target’s top floor headquarters. OverLord obliterates who he believes to be Frank again but something is very wrong. A flood of letters arrives at the Chicago Police Department following the recent piece about Dragon on The Jerry Rivers Show. They all contain various people claiming to know Dragon in his past existence and are largely dismissed as nonsense. His fellow officers take great joy in reading out these letters but one of them is more serious. Alex Wilde reads out the letter from an Amy Belcher who states that she has received psychiatric treatment and no longer hears voices in her head. She has given up her previous identity of Sensation of the Nixed Men and now wishes to be called She-Dragon. Dragon asks about Alex Wilde’s attempted recruitment of Mace. It was reasoned that the police could benefit from having the vigilante within their ranks but Dragon points out that it was a good thing Mace turned them down as they had a problem with Dart using excessive force, and Mace is much worse. The partners receive a call about a super-freak slaughtering several guards at Donner Electronics and they race off to investigate. Justice is a young hero that wears the original costume of SuperPatriot and he leaps into action to break up what he wrongly believed to be a drug deal. The two people he confronted were actually selling computer chips which make their actions all the more suspicious if not necessarily criminal. He goes to a factory for Donner Electronics where he gets into a fight with the arriving She-Dragon. Dragon and Alex arrive on the scene to break up the fight between the young heroes whose fighting may have allowed the real criminals to escape. Dragon leaves the pair in the custody of Alex Wilde whilst he gives chase to two intruders. He is confronted by a harmless looking man called OpenFace but this villain leaps at Dragon with his head split open, revealing a huge mouth with rows of razor sharp teeth. As OpenFace gripped down around Dragon’s head, the two combatants plummet through the floor to the ground below. Dragon finally breaks free after having bitten off the huge second tongue of OpenFace and spitting it out. He leaves Alex to stand over the fallen freak as an ambulance is called to hopefully reattach the tongue. Dragon leads Justice and She-Dragon in search of OpenFace’s accomplice but they wind up empty handed. 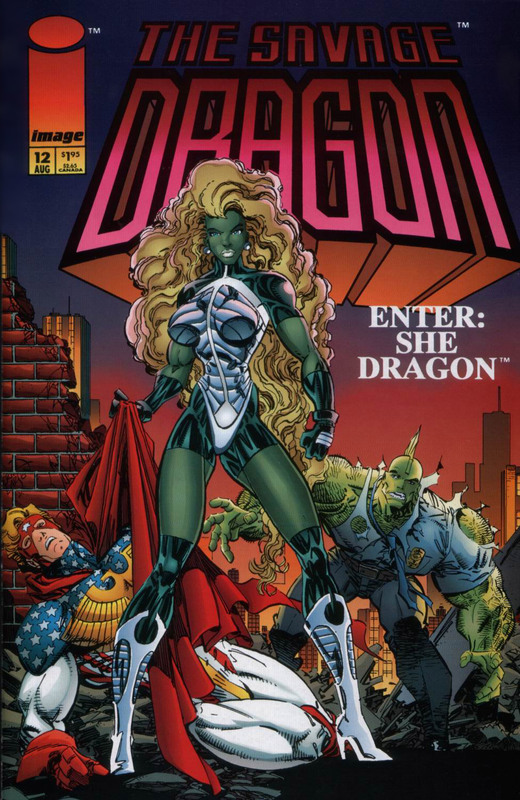 Justice leaves the scene but She-Dragon is forced to accompany Dragon back to the precinct to answer some questions. The heroes are unaware that OpenFace’s partner, Octopus, is hiding in the shadows and watching them depart. He has in his possession the item that the villains had stolen and departs to put their plan into action. NOTE: The “Savage Dragon Vol. 4: Possessed” trade paperback collection adds in a new four-page prologue showing Mighty Man’s fight with Overpower.